The Church Office is open this week. Rev. Melissa is working her normal schedule. MaryBeth is on vacation through August 8. Karen is working her normal schedule. Hal is working his normal schedule. While MaryBeth is on vacation this week, please send any August 10 Thread announcements to Melissa at [email protected] Thank you. The Church Office will be open this week. MaryBeth will be working her normal schedule. Karen will be working remotely. Hal will be working his normal schedule. We are back to our normal schedule of two services being offered Sunday mornings at 9:45 and 11:30. Summer Religious Education will continue to be offered at 9:45 AM only with Nursery care available for all services through the end of August. This year at General Assembly there was a lot of talk about Unitarian Universalists becoming more missional. What does that mean, you wonder? That is what this service will be about! We would like to offer a reminder that on Sunday mornings, the pews located against the back wall of the Sanctuary are reserved for parents with young children. This allows them to easily enter and exit the Sanctuary with their children, during the service, with minimal disruption to the others around them. Thank you. Mark Your Calendars! Important RE Dates! August 10th, 17th, 24th and 31st ~ Summer RE continues at 9:45. Preschool children meet in the upstairs classroom and for school-aged and younger youth gather in Fessenden. Childcare for babies and children up to age 4 is provided in the nursery during both the 9:45 and the 11:30 services. August 10th ~ Summer RE Field Trip to Kent Healthcare Center for school-aged children and younger youth. Please email Karen Lapidus ~ [email protected] ~ if you haven’t received the email and would like more details. We are departing the church no later than 9:55 am! September 7th ~ Ingathering Sunday. See the Chalice Flame and the e- nUUs for more information about this wonderful multigenerational worship experience. Preschool RE starts this day @ 9:45 for children age three by 9/1/14 to those 5-year-olds who are not attending Kindergarten in the fall. September 14th ~ RE starts for everyone else. At 9:45, we have classes for preschool, Grades K-2 and Grades 3-5. At 11:30, we have our school-aged RE class, Middle School and High School Youth Group. New UU Classes in August! Curious? Interested in learning more? Ready to take the next step? Our New UU classes cover everything you wanted to know about the Unitarian Universalist Church of Kent in particular and Unitarian Universalism in general, but didn’t know where to go or whom to ask. Well, maybe not everything, but we try to give you an overview, a starting point. Some history of both, some organizational details. Come join the conversation. And, if you’re curious about membership, this is the place to be. Part 1 will be on Sunday, August 10 from 9-11 am. Part 2 will be on Sunday, August 17, from 9-11 am. You may attend one or both, although attendance at both is encouraged. Different topics will be covered in each. We will gather at the Annex, the yellow house next to the church. We wish to dispose of a small load of hazardous waste from the basement of the former Mill’s property. The site at 1201 Graham Road is open to residents of Summit County only and is open from 2:00pm until 8:00 pm on Thursdays. If you are a resident of Summit County and can take on this task, please email Randy Ruchotzke at [email protected] He will help you load and unload. Have You Seen Those Painted Rocks Around the Church? Those are for you – yes you! They are a gift from the children in Summer Religious Education. Please take one as a gift from them to you. The rocks will be replenished throughout the summer. This month you may choose between two novels. Maine by J. Courtney Sullivan is the story about three generations of women who converge on the family beach house in this wickedly funny, emotionally resonant story of love and dysfunction. The Bookstore by Deborah Meyler is a witty, sharply observed debut novel about a young woman who finds unexpected salvation while working in a quirky used bookstore in Manhattan. Impressionable and idealistic, Esme Garland is a young British woman who finds herself studying art history in New York. She loves her apartment and is passionate about the city and her boyfriend; her future couldn’t look brighter. Until she finds out that she’s pregnant. In September we will be reading Orange is the New Black: My Year in a Woman’s Prison by Piper Kerman. At October’s gathering, we will have a book exchange so begin thinking about books you might want to trade with other book group members. If you have any questions you may contact Bonnie Harper at [email protected] All are welcome. We Continue to Make Progress! We just received confirmation on the Mills House demolition date. Unfortunately, we will not meet our end of July goal but we continue to make progress. The contractor has set the demo date for August 12. The asbestos abatement and the basement clean-out were completed a few weeks ago. Many thanks to everyone who helped with the basement project! While we wait for demolition, Habitat Restore will be salvaging the boiler, hot water tank and radiators. We’re happy to know that so many items from the house have been repurposed and saved from going into a landfill. This has been a long-time undertaking but as we continue to wait a few more weeks, we know we are moving another step closer to realizing our dreams of expansion! Save the date – Oct. 3-5. Where’s Walden in the Fall will be held at Loleta Recreation Area in Pennsylvania. Keep watching the Thread and e-nUUs for more information. Our church vision statement calls us to expand our physical facilities to better accommodate our growing congregation. As the church moves forward with our expansion and renovation plans- building a new social hall, renovating the basement to create new RE space, expanding the sanctuary– the Capital Campaign Team would like to hear from members- What are your hopes and dreams for our new space? We would welcome responses to the following questions. 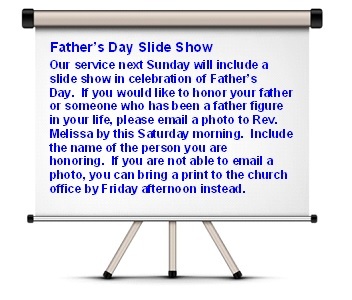 You can simply reply to this e-mail, inserting your responses, or fill out the attached document and send it to church administrator MaryBeth Hannan. Thank you, and start dreaming! 1. How do you envision us using our new space? What kinds of activities do you think we will be able to do, that we can’t do now? 2. Why is pursuing our church vision important to you? Please know Rev. Melissa will be working her normal schedule next week and the Office will be open while MaryBeth is on vacation, August 4 – 8. While MaryBeth is on vacation next week, please send any e-nUUs announcements or August 10 Thread announcements to Melissa at [email protected]. Thank you. We are back to our normal schedule of two services being offered Sunday mornings at 9:45 and 11:30. Summer Religious Education will continue to be offered at 9:45 AM only with Nursery care available for all services. August 3 – Spiritual But Not Religious? Have you heard people use that phrase to describe themselves? Media, scholars and pollsters have all invested a great deal in understanding who the “spiritual but not religious” are and whether they might have any interest in formal religious communities. This morning we explore the growing “spiritual but not religious” identity with a Unitarian Universalist lens. August 3rd.10th, 17th and 24th ~ Summer RE continues at 9:45. Preschool children meet in the upstairs classroom and for school-aged and younger youth gather in Fessenden. Childcare for babies and children up to age 4 is provided in the nursery during both the 9:45 and the 11:30 services. August 10th ~ Summer RE Field Trip to Kent Healthcare Center for school-aged children and younger youth. Please email Karen Lapidus ~ [email protected] ~ if you haven’t received the email and would like more details. The OWL and Coming of Age youth will be receiving more detailed information about those programs in an email. Those are for you – yes you! They are a gift from the children in Summer Religious Education. Please take one as a gift from them to you. More “Simple Gifts” are planned all summer long. We are making decorated placemats and fleece lap blankets for the residents at Kent Healthcare Center. On August 10th, we will be visiting the facility to deliver the gifts and to sing songs. Parents and caregivers of school-aged children will receive more information via email. Part 1 will be on Sunday, August 10 from 9-11 am. Part 2 will be on Sunday, August 17, from 9-11 am. You may attend one or both, although attendance at both is encouraged. Different topics will be covered in each. We will gather at the Annex, the yellow house next to the church. If you have any questions, contact Claudia Miller. The Patricia Pownall UU Book Group will be meeting on Tuesday, August 12 at 7 pm in the home of Marion Yeagler. This month you may choose between two novels. Maine by J. Courtney Sullivan is the story about three generations of women who converge on the family beach house in this wickedly funny, emotionally resonant story of love and dysfunction. The Bookstore by Deborah Meyler is a witty, sharply observed debut novel about a young woman who finds unexpected salvation while working in a quirky used bookstore in Manhattan. Impressionable and idealistic, Esme Garland is a young British woman who finds herself studying art history in New York. She loves her apartment and is passionate about the city and her boyfriend; her future couldn’t look brighter. Until she finds out that she’s pregnant. In September we will be reading Orange is the New Black: My Year in a Woman’s Prison by Piper Kerman. At October’s gathering, we will have a book exchange so begin thinking about books you might want to trade with other book group members. If you have any questions you may contact Bonnie Harper. All are welcome. The Capital Campaign Team has been meeting since March. 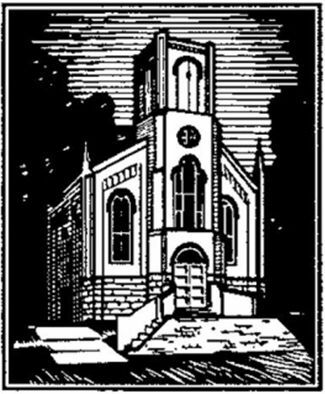 We have been charged by the Board of the UU Church of Kent with raising funds toward the construction of a fellowship hall, and renovations of religious education space and the sanctuary in the existing church building. We’re busy organizing and recruiting volunteers. We welcome your questions and offers of help. Join Lee Brooker on Tuesday, August 5 at 7 PM in Fessenden Hall. He would like to share his experience on the UU College of Social Justice/UU Living Legacy Mississippi Civil Rights Bus Journey that he participated in while everybody else was at S.I.! This journey featured visits to Civil Rights Movement sites throughout Mississippi. Last month I delivered a sermon reflecting on the terrible journeys of the many unaccompanied immigrant children coming into the United States from Central America and Mexico. I talked about my fear that they will face deportation even though the UN reports that many likely qualify for refugee status. After that sermon, Dan Flippo suggested to me that my concern might warrant proposing an Action of Immediate Witness (AIW) at the Unitarian Universalist Association General Assembly. The UUA Commission on Social Witness (CSW) describes an Action of Immediate Witness as a statement “that expresses the conscience and carries the authority of the delegates at the General Assembly at which it is passed.” I followed up on his suggestion by writing to several immigration justice leaders in the UUA to ask their advice. I was encouraged to propose an AIW calling people to an upcoming event in Washington DC focused on asking President Obama to stop the deportations. With help from Dan, several colleagues and lay leaders as well from members of the Commission on Social Witness (including former UUCK member Susan Goekler who is chair of the CSW,) I proposed an AIW which was accepted and ultimately endorsed by the General Assembly. Dan took video of me presenting a statement in support of the AIW which he posted to our congregation’s FB page if you are interested in learning more. I am leaving this afternoon to go to DC to participate in the Pray for Relief Faith Summit on Stopping Deportations. Check out this link for much more information. This week, Rev. Melissa will be working ½ days in the Office. Director of Religious Education, Karen Lapidus, is available by appointment and Music Director, Hal Walker is off this week. The Church Office is open this week and also next week while Rev. Melissa, Karen Lapidus and Hal Walker are attending Summer Institute (SI). While at SI, Rev. Melissa will check email daily and will be available by cell phone, as well. One Sunday service is offered at 9:45 AM through the month of July only. We will return to our regular schedule of two services at 9:45 and 11:30 AM on August 7. Every year Rev. 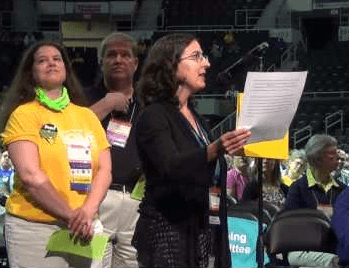 Melissa attends the Unitarian Universalist Ministers Association Ministry Days and the Unitarian Universalist Association General Assembly. After a full week of outstanding worship, workshops, public witness and stimulating conversation, she returns filled with inspiration. This Sunday morning she hopes to share some of that inspiration with you. The deeply affecting service last Sunday, “Taking Perspective, Giving Perspective, arranged and organized by Amanda and Andrew Rome, featured moving personal stories by congregation members and guests. Each speaker generously shared the following sources. Amanda and Andrew Rome: “Adopting the Hurt Child”, and “Parenting the Hurt Child”, both by Gregory Keck and Regina Kupecky. Ann Lapidus: “Touching the Rock: An Experience of Blindness”, by John M. Hull. Fred Smith: “Alcoholics Anonymous”, published by the AA General Service Board in New York. Our theme is “Simple Gifts”, which will be a series of easy, mostly stand-alone social action and social justice projects. Summer RE will take place at 9:45 am only. During the month of July, we will only have services at 9:45. In August, we’ll have the usual two services at 9:45 and 11:30. At 11:30, the only option for children and youth is to attend the worship service with their parents/designated adult. This year we are adding a separate preschool program along with the multi-age group, which includes school-aged children and Middle School youth as helpers. Nursery care will be available for our youngest UUs during all worship services during the summer. The preschool will meet in the upstairs classroom while the older children will meet in Fessenden Hall. Retiree’s Lunch – Tuesday, July 15 at noon. We’ll meet for an hour to an hour and a half depending on the number of people who attend so everyone has an opportunity to check in with the group. All retirees are welcome to join us. Bring your own lunch; beverages will be provided.Congregational Administrator Mary Beth Hannan will host the lunch in Rev. Melissa’s absence. Tickets are still available for the UUCK Garden Tour and Salad Supper. Do join fellow nature lovers as we stroll through the gardens of Gingr Vaughn, Amanda and Andrew Rome, Trish and Anatol Kwartler, and then visit two community garden sites including Freedom House, a housing facility for military veterans, and the Kent Community Gardens. We will end our experience at Ode to Joy, the Garden Club of Kent’s shelter for dinner and community time. Attendees will gather at the Church parking lot at 1:30 on Saturday, July 26th to car pool to the first garden. Interested? Tickets are $25 and can be purchased on Sundays from Claudia Miller or Kathie Slater. You may also call Kathie at 330-673-2789 to reserve a spot. We continue to move forward towards our expansion. On Monday, July 7 the asbestos abatement at Mills House began. We ask that folks keep clear of the house during this time. This project will continue for approximately one week. Following that will be many small tasks that will include the final clearing of any remaining contents in the house. We project that the house demolition will be concluded by the end of the month! Rod and Mary Thompson are back in the Kent/Ravenna area now that Rod has completed his interim ministry in North Carolina. They have several boxes, including wardrobe boxes available if anyone is in need. If interested, please contact Rod. About the July Artist . . . The Patricia Pownall UU Book Group will be meeting on Tuesday, July 22 at 7 pm in the home of Chris Hurlbut. This month we are reading The Peasant Prince: Thaddeus Kosciuszko and the Age of Revolution by Alex Storozynski . Thaddeus Kosciuszko, a Polish-Lithuanian born in 1746, was one of the most important figures of the modern world. Fleeing his homeland after a death sentence was placed on his head, he came to America with little more than a revolutionary spirit and a genius for engineering. He quickly proved his capabilities and became the most talented engineer of the Continental Army. A lifelong champion of the common man and woman, he was ahead of his time in advocating tolerance and standing up for the rights of slaves, Native Americans, women, serfs, and Jews. Following the end of the war, Kosciuszko returned to Poland and was a leading figure in that nation’s Constitutional movement. He became Commander in Chief of the Polish Army and valiantly led a defense against a Russian invasion. He lived the remainder of his life as an international celebrity and a vocal proponent for human rights. This definitive and exhaustively researched biography fills a long-standing gap in historical literature with its account of a dashing and inspiring revolutionary figure. In the month of August we will be reading Maine by J. Courtney Sullivan or The Bookstore by Debroah Meyler. In September we will be reading Orange is the New Black: My Year in a Woman’s Prison by Piper Kerman. If you have any questions you may contact Bonnie Harper. All are welcome. I will be going to DC to participate in the Pray for Relief Faith Summit on Stopping Deportations at the end of the month. I’m hoping a bunch of people from Northeast Ohio will go with me and am willing to try to organize ride sharing, a van or maybe even a bus, if warranted. Are any of you moved to attend? Check out this link for much more information and please note the deadline to register is July 15. Our friends at the United Methodist Church have invited us to their annual Concert featuring the Stan Hywet Concert Band on Monday, July 14 at 7:00 pm at the United Methodist Church. The concert will be followed by refreshments. Admission is FREE; free-will offerings will be gratefully accepted. Rev. Melissa is on vacation this week. If you have an urgent pastoral concern while she is away, please contact our Affiliated Community Minister Rev. Renee Ruchotzke by phone through Thursday July 3. Rev. Melissa will take emergency calls over the Fourth of July weekend. Sunday services are offered at 9:45 and 11:30 AM. Please note that for the month of July only, one service at 9:45 am will be offered. We will return to our regular schedule of two services at 9:45 and 11:30 am on August 7. Sacred Song Circle every Thursday in Fessenden Lounge. Every Thursday a group of us gather to create sacred space for thirty minutes by singing together in community. This is a safe space where all levels of singing experience, comfort level and skill are welcome. There is no need to bring anything with you but water. Saunis Parsons leads the group in singing choruses, zipper songs, familiar hymns, camps songs, and sometimes even children’s songs. Sacred songs for us are songs which celebrate and encourage things like hope, peace, community, care for each other and the earth, forgiveness, and thankfulness. We gather in the sanctuary around 6:00 PM, and sing from 6:15 till 6:45. Typically folks come up the stairs to the back door of the sanctuary, but if you need to come in on the ground floor to use the elevator, just call Saunis at 330-472-0956. Hope to see you there! Summer RE will take place at 9:45 am only. At 11:30, the only option for children and youth is to attend the worship service with their parents/designated adult. During the month of July, we will only have services at 9:45. In August, we’ll have the usual two services at 9:45 and 11:30. This year we are adding a separate preschool program along with the multi-age group, which includes school-aged children and Middle School youth as helpers. Nursery care will be available for our youngest UUs during all worship services during the summer. The preschool will meet in the upstairs classroom while the older children will meet in Fesenden Hall. The Summer RE Program is in need of clean, used t-shirts of various colors and patterns for a project we are doing on July 6th. Please leave your donations in the bin located at the northeast corner of Fessenden Hall. We continue to move forward towards our expansion. On Monday, July 7 work will continue on the Mills House with beginning of the asbestos abatement. We ask that folks keep clear of the house during this time. This project will continue for approximately one week. Following that will be many small tasks that will include the final clearing of any remaining contents in the house. We project that the house demolition will be concluded by the end of the month! Our Care Team invites you to stop by their table in Fessenden Hall after either service to start or sign cards others have started for people in our community who might appreciate the gesture of care and concern. Help Needed This Saturday at the Hot Lunch Program at Trinity Lutheran Church! Due to family illness, the team that had committed to prepare and serve the lunch this Saturday has greatly diminished in numbers. We need at least 3 people to fill in. The time commitment is 10:30 – 1:00. Adults, as well as children with their families are welcome to participate. This is a great way to live our Unitarian Universalist faith! If you are able to help, please notify Karen Lapidus ([email protected]) or Tanya Kahl (Tanya Kahl <[email protected]) for more details. Sunday services are offered at 9:45 and 11:30 AM. Please note that during the month of July only, once service at 9:45 am will be offered. We will return to our normal schedule of two services at 9:45 and 11:30 am in August. Rev. Melissa’s references for her “Blessing of the Animals” reflection last Sunday include: In Praise of Animals, a treasury of poems, quotations and readings, collected by Edward Searl. This may be found in our church library. An additional reference source is: Blessing of the Animals: Celebrating our Kinship With All Creation, by Gary Kowalski. Those who are grieving the loss of a pet might like to know we have two excellent books in our church library about coping with pet loss: Goodbye Friend: Healing Wisdom for Anyone Who Has Ever Lost a Pet, by Gary Kowalski, and Goodby My Friend: Grieving the Loss of a Pet, by Mary and Herb Montgomery. 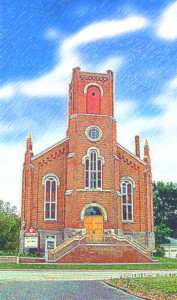 The Sunday Program Committee will be meeting soon to plan lay-led Sunday services for the summer. It is now accepting program proposals. 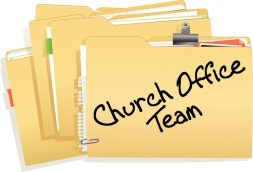 If you think you might be interested in preparing and leading a service, please contact a member of the Program Committee –Lois Weir, Liz Bright, Andrew Rome, Lori McGee, or Christie Anderson. They can provide you with assistance if you are new to the process. Links to information about planning a service and the proposal form may be found on the Sunday Program Committee’s web page at //kentuu.org/ministry/sunday-program/. Summer RE program begins this Sunday @ 9:45! To kick-off the summer RE program, on June 15th, the school-aged children and youth will be guided through a process of envisioning their ideal space as we move into the building expansion and renovation. Summer RE will take place at 9:45 am only. At 11:30, the only option for children and youth is to attend the worship service with their parents/designated adult. During the month of July, we will only have services at 9:45. In June and August, we’ll have the usual two services at 9:45 and 11:30. There will be a brief ceremony to dedicate and sanctify our new Play Space behind the church. We will circle around the space and bless it with our words and intentions. It has come to our attention recently that there are some members and friends that may not be receiving the Weekly e-nUUs and/or the monthly newsletter, The Chalice Flame. If you happen to be one of these individuals but would like to begin receiving either of these publications electronically, please send a request, including your email address, to the Church Office at [email protected]. Thank you. Countryside Conservancy called a few days ago to personally express their gratitude for the generosity of this congregation. They were thrilled with the special collection donation and very grateful to be a beneficiary of the gift. It was requested that we extend their appreciation to those who supported the collection. Thank you! Watch for more information in the future. Sunday services are offered at 9:45 and 11:30 AM. 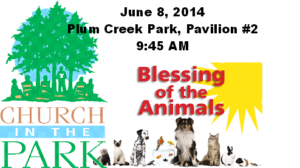 Back by popular demand, we will once again have a Blessing of the Animals during our annual outdoor service at Plum Creek Park in Kent. We will have one service only beginning at 9:45 am at pavilion number 2. Bring a lawn chair or a blanket to sit on and your cats or dogs or other pets on a leash or in a crate. If you don’t think your pet will do well around all those other pets and people, feel free to bring a photograph instead. Would you like to enjoy a night of great music all and help fund an Accompanist to the Choir at the same time? If so, please come to the Saunis and Friends of the UU Church of Kent concert on June 6 and enjoy an evening of music provided by many of our talented Friends of the UU Church of Kent. I love to make music with all of the various musicians this church has been blessed with, but it’s hard to make that happen very often. So I decided to invite all kinds of musicians to join me for a night of music- making to benefit the church and a bunch of them said “ Yes! Let’s do it!” Some of the songs will be ones chosen by the folks who bought choosing-rights and front row seats during the Service Auction in November. So far I know there will be a wide variety of songs including: funny songs, sad songs, naughty songs, Celtic songs, folk songs, blues, and some ragtime. Audience participation is encouraged. During intermission there will be goodies. The concert starts at 7:00 PM in the sanctuary of the UU Church of Kent. The cost is $15.00 per person. Spread the word. Summer RE program begins! Our theme is “Simple Gifts”, which will be a series of easy, mostly stand-alone social action and social justice projects. To kick-off the summer RE program, on June 15th, the school-aged children and youth will be guided through a process of envisioning their ideal space as we move into the building expansion and renovation. We will dedicate the new play area, as well. Summer RE will take place at 9:45 am. During the month of July, we will only have services at 9:45. In June and August, we’ll have the usual two services at 9:45 and 11:30. It has been a long time coming, but an outdoor play space for kids at UUCK is now a reality! The space is right behind the church on half of the lot we purchased this past winter. We want you to be aware that the church is not supplying a play space monitor. Adult supervision is required for kids playing in the space at all times. We hope children and families will enjoy this space and find it a great addition to their time at church! The Patricia Pownall UU Book Group will be meeting on Tuesday, June 10 at 7 pm in the home of Mary Ann Kaspert. This month we are reading Cloud Cover: A Memoir of Perseverance and Transformation by Margo Milcetich . Born in Boston in 1953, traveling the world, eschewing a college career at Brown University in Rhode Island, in the ’70s, Margot Milcetich turns her focus to meditation for peace of mind. Eventually, she lands in Kent, Ohio, in a home by a lake, married with two children, trying to find herself, and creating an extraordinary life in an ordinary “householder” package. Meditation and yoga help her to heal herself, living in the beauty of nature, enabling her to transcend a devastating diagnosis, become an equal, loving partner to her spouse, find meaningful work and ultimately expressing her voice. She integrates within herself what felt unmoored and fractured. Today’s yoga practitioners will especially appreciate this account of how yoga and meditation transcend our circumstances. In July we will be reading The Peasant Prince: Thaddeus Kosciuszko and the Age of Revolution Alex Storozynski . If you have any questions you may contact Bonnie Harper . All are welcome. On any given Sunday, we usually have a handful of people who need a ride to church and back home again. Our ability to respond to requests for rides has been inconsistent. Sometimes we are able to help link riders with drivers, and other times we run up against a lack of volunteers. We are wondering if we might be able to identify a person or two who would be regularly available to drive in exchange for gas money and a little stipend in appreciation for the time. Knowing that someone is available even when we cannot find volunteers would make it possible for us to help more people get to church more often. If you are interested in exploring this possibility, please contact Rev. Melissa at the church office. What is permaculture? And, What might permaculture mean for UUCK – now and in the future? Come explore the 7th UU Principle on the interdependent Web of Life with Tom Gibson of the First Unitarian Church of Cleveland. Related to a church project for national UUA Green Sanctuary certification, Tom facilitated use of this ecologically sustainable creative design process to cultivate northeast Ohio’s first 5,400 square foot permaculture “nibbling” garden: a feast for the eyes and the earth and its people, animals, insects, and plants. June 10, 7pm in Fessenden Hall. All members, friends and community members are welcome! For further information contact Mary Lou Holly. Watch for more detailed information in the future. The Building Expansion Team is currently defining the requirements for our new fellowship hall and renovations to our church and grounds. This is your church, and your opinions are vital to the process. Please click on the link below and take our online survey to make your needs and wishes known. The survey will require approximately 10 to 15 minutes to complete. Paper copies will be available in Fessenden Hall on the BET bulletin board. Survey responses are due by May 11. 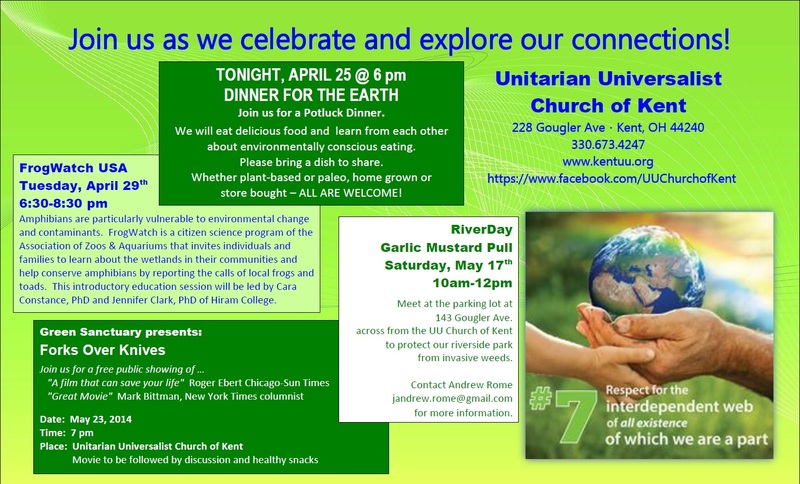 UU Church of Kent’s advertisement with Kent Area Chamber of Commerce that will be e-blasted Friday, April 25. Led by Matthew McHale, Intern Minister, West Shore UU Church and Worship Associate Justin Czekaj – This spring, as signs of new life and new possibilities emerge all around us, we consider our relationship to one another and to the environment which sustains all life on this planet. Can planting a garden be a radical act? How can the way we grow and eat food help create communities that align with our liberal religious values—promoting justice and honoring the interconnected web of existence? Rev. Melissa’s references for her Easter Sunday homilies were taken from two different sources. The Youth Sunday worship service will happen at both services on Sunday, May 4th. The high school youth have chosen “Letting Go” as their theme. They have created a worship experience filled with story, music, readings and homilies that is sure to inspire and enlighten. All Annual Reports to be included in the Annual Meeting packet are due May 1, 2014. Please submit or email reports to MaryBeth at [email protected]. Annual Meeting packets will be available to the congregation on May 14. The Annual Congregational Information Meeting is scheduled for May 28 @ 7 PM and the Voting Meeting will be held on June 1 @ 12:30 PM. The Building Expansion Team postponed the meeting between services to from April 20 to April 27. The purpose of the meeting is to invite you to engage with an expansion project survey that will help guide the members of the Building Expansion Team in discussion with the architects. Don’t forget your Surprise Friend this week! Bring your surprise (a note, a piece of artwork, etc.) and leave it on the Surprise Friends table in Fessenden Hall. The Food for Thought group would like to thank all those who contributed to our wonderful Easter Sunday coffee hour. After Rev. Melissa’s inspiring homilies and Hal’s wonderful celebratory music, the “groaning table” and the sustained fellowship we enjoyed together in Fessenden Hall made the morning especially memorable. We are fortunate, indeed to be a part of this generous congregation. Anyone interested in joining this group may contact Claudia Miller. New UU Classes in May! Part 1 will be on Sunday, May 4th, from 9-11 am. Part 2 will be on Sunday, May 18th, from 9-11 am. You may attend one or both, although attendance at both is encouraged. Different topics will be covered in each. We will gather at the Annex, the yellow house next to the church. If you have any questions, contact Claudia Miller or Marion Yeagler. The Patricia Pownall UU Book Group will be meeting on Tuesday, May 13 at 7 pm in the home of Trish Kwartler. This month we are reading Let the Great World Spin by Colum McCann. Let the Great World Spin is the critically acclaimed author’s most ambitious novel yet: a dazzlingly rich vision of the pain, loveliness, mystery, and promise of New York City in the 1970s. Elegantly weaving together seemingly disparate lives, McCann’s powerful allegory comes alive in the unforgettable voices of the city’s people, unexpectedly drawn together by hope, beauty, and the “artistic crime of the century.” A sweeping and radical social novel, it captures the spirit of America in a time of transition, extraordinary promise, and, in hindsight, heartbreaking innocence. In June we will be reading Cloud Cover by Margo Milcetich. If you have any questions you may contact Bonnie Harper. All are welcome. Due to a lapse in security, the doors codes have been changed. All previous codes were purged and deactivated. If you are in need of a code for the Church and/or Annex, please contact the office with your request. Join us for a Potluck Dinner to eat delicious food and learn from each other. Everyone should bring a dish and share the story of their food, as sharing a meal and our stories helps us care for the living Earth with reverence and gratitude. Our goal is to share and respect each other’s food decisions, if that is good home cookin’ like my Mama’s, or nutritionally exact FDA certified food, or organic/local/seasonal/artisanal fare. Whether plant-based or paleo, home grown or store bought – all are welcome. Contact Andrew Rome for additional details! Amphibians are declining globally and their disappearance is likely to have significant impacts on ecosystems. Amphibians are particularly vulnerable to environmental change and contaminants. FrogWatch is a citizen science program of the Association of Zoos & Aquariums that invites individuals and families to learn about the wetlands in their communities and help conserve amphibians by reporting the calls of local frogs and toads. Join us on Tuesday, April 29th, from 6:30-8:30pm for a FrogWatch USA introductory education session led by Cara Constance, PhD and Jennifer Clark, PhD of Hiram College. The session will be held in the sanctuary of the Unitarian Universalist Church of Kent. Meet at the parking lot at 143 Gougler Ave. across from the Unitarian Universalist Church of Kent to protect our riverside park from invasive weeds. Contact Andrew Rome for more information. The Finance Committee will meet tomorrow morning, April 24 to set the budget for our next fiscal year beginning July 1. Below is an announcement that was sent last week detailing the results of the current stewardship campaign. If you would like to make a pledge or consider an increase in pledge, please send an email to the Church Office, [email protected] or complete the online pledge card found on our website: //kentuu.org/membership/stewardship/ Thank you. The good news is that many people responded to our annual stewardship campaign. With thanks to all of the leaders and all of you who chose to make a pledge, we have nearly $220,000 in commitments for our next fiscal year. We are very grateful for your ongoing support! The other news is that the total pledge commitments for our next fiscal year are the same as our pledge commitments for the current fiscal year. This means that our budget is flat. Without additional pledges, we will be unable to implement the new ministry goals we set for next year. Because of increased costs we cannot control, the same pledge income we received for this fiscal year will not go quite as far next fiscal year. This means that we will need to make some modest cuts to our budget for next year. The Finance Committee will be meeting to finalize the budget for the Board of Trustees this coming week. If you haven’t yet made a pledge or would like to consider an increase to your pledge, please let the church office or one of our stewardship campaign leaders know before Thursday morning. Thank you for your generosity and commitment to support our beloved church. The Building Expansion Team is postponing the meeting between services from April 20 to April 27. The purpose of the meeting is to invite you to engage with an expansion project survey that will help guide the members of the Building Expansion Team in discussion with the architects. What are we? What does it mean to be human? Perhaps the biblical stories of Jesus’ final days can give us some insight into the nature of our own being. call 810-265-4007 to reserve tickets. What We Choose: Ethics for Unitarian Universalist adult education class final session will meet tomorrow, April 10 at 7:00 PM in Fessenden Hall. Beth and Joe K. and their children will be moving to eastern Pennsylvania soon. Please join the RE Committee in thanking the family for their many years of volunteer service to the children and youth of our church community. Both Beth and Joe have taught RE or served as Youth Group Advisor for many years. Joe is the current Headmaster of KentHogwarts and Beth is a faithful member of the RE Committee. There will be a special social hour this Sunday, April 13th. Many thanks to everyone who supported the upper elementary RE class’ collection of pet toys for donation to the Humane Society of Greater Akron. The students in this class decided to help the Humane Society because they believe all animals should be cared for. The class will be visiting the Humane Society on April 19th to drop off the donations. Due to a lapse in security, the doors codes will be changed on Monday, April 14. ALL CURRENT CODES WILL BE PURGED AND DEACTIVATED. If you are in need of a code for the Church and/or Annex, please contact the office to request one. On Sunday April 20th, 2014 the Building Expansion Team (BET) will hold a short informational meeting during the break between the two services. At this meeting the BET will give information on how all church members can fill out a survey to help prioritize construction items for the fellowship hall, sanctuary, and Religious Education space. We’ll meet for an hour to an hour and a half depending on the number of people who attend so everyone has an opportunity to check in with the group. All retirees are welcome to join us. Bring your own lunch; beverages will be provided. You’ve been matched! There is an envelope on the Surprise Friends table in Fessenden Hall with your Surprise Friend name on it. If you don’t remember your Surprise Friend name, please check with one of the RE Committee Members below. Inside the envelope, you will find a note with information about your Surprise Friend, including his or her favorite hobbies, books, colors, and more! Be sure to pick up your envelope today to get started. Please remember, you have made a commitment to leave a surprise the following Sundays: April 20,27 and May 4,11. Surprises are as diverse as the Surprise Friends who exchange them. You’ll find some suggestions in your envelope. Gifts are discouraged until the Revealing Ceremony during coffee hour on May 18 when small tokens of friendship (not to exceed $5 in cost) may be exchanged. Don’t forget to bring your first note or piece of artwork next week and leave it on the Surprise Friends table. But remember, be careful you aren’t discovered! The Library committee has added another category to the collection: UUCK Authors. So far we have works from Caroline Arnold and Margot Milcetich. Additional works by congregational writers would be appreciated. Do speak to any Library committee member if you have suggestions. Haven’t tried Small Group Ministries? UUCK supports two ongoing SGMs: Chalice Group and Food for Thought. Both ministries strive to bring partakers together in common pursuit of deeper understanding on theme topics ranging from “holiness” to “money.” For the next few Sundays during Coffee Hour, join with members of this year’s Food for Thought Group in the enjoyment of goodies (it’s one way we distinguish ourselves!) and conversation about our experiences in FFT and why it’s worthwhile to us. We hope that by our sharing, you will consider participating in a Food for Thought group next time around (October, 2014). Sign interest sheet at our Food for Thought table during April. We are looking for the individual who may have picked up a sewing machine from the Mills’ house? We have some parts and the instruction manual to the sewing machine that you may be interested in. Please contact the Church Office if you would like the parts and manual. living Earth with reverence and gratitude. Deliciously interesting! Contact Andrew Rome for additional details (or to let me know that you’re coming). March is rapidly coming to a close and with it, National Nutrition Month and Harvest for Hunger. Sadly, the food baskets have remained nearly empty all month. Won’t you please consider donating non-perishable food items this weekend? The Super-Six remain much in need – PB (and jelly, of course), canned veggies, soup, beef stew, tuna and cereal – as well as other staples such as pasta, spaghetti sauce, rice, beans, canned fruit, crackers, meal-in-a-box & meal-in-a-can & macaroni n’ cheese mix. Children often enjoy pudding cups, fruit snacks, granola bars, raisins, and other wrapped snack items. If you are not grocery shopping this week, donations of $10 Acme grocery cards are most appreciated so KSS clients can purchase fresh foods or non-edibles that food stamp benefits do not allow. 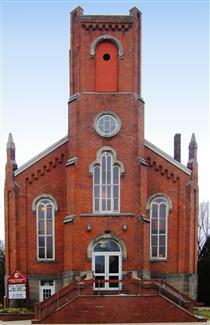 First Congregational Church of Ravenna is hosting a mission project jewelry sale on April 10 and April 12. The paper bead jewelry is made by ladies in Uganda and sold through the non-profit business “Bead for Life.” All profits from the jewelry sales will go towards helping Ugandan ladies work their way out of poverty. Hospice of Western Reserve Warehouse Sale: Donation are needed for our next sale, Friday, May 9, 8:00 am – 4:00 pm and Saturday, May 10, 9:00 am – 3:00 pm at Hospice of the Western Reserve Headquarters, 17876 St. Clair Ave., Cleveland, OH 44110. Proceeds support patients and families of Hospice of the Western Reserve throughout northern Ohio. They are accepting gently used indoor and outdoor furniture, other household items, collectibles, framed artwork, and holiday items. To donate items, please contact the Warehouse Sale Team at 800.707.8922, ext. 6881. Pick up can be arranged for larger items. It’s not too late to make a pledge! Thanks to everyone who has helped make this a successful campaign! Please come for pancakes and an update on our expansion process! Congregational Information Update this Sunday April 15 Between the first and second services this Sunday the Board of Trustees will offer an update to the congregation on the progress we have made related to our on-site expansion exploration and our plans for a capital campaign. We have lots of good news to share! Please be aware, however, that due to the sensitive nature of some of our plans and the limited time between services, this will be a preliminary report designed to keep the congregation appraised of the big picture as it stands at this point. We expect an additional report with many more details will be delivered at our annual congregational information meeting on May 31, 2012. Led by Deb Chaney and Worship Associate Elaine Bowen – How do we cultivate the courage, compassion, and connection that we need to engage in our lives from a place of authenticity and worthiness? Deb Chaney is the , Commissioned Lay Leader of the Unitarian Universalist Congregation of Greater Canton. While Deb is leading our services, our minister the Rev. Melissa Carvill-Ziemer will be leading worship in Canton. We are pleased to make this exchange and we hope you will enjoy the experience. Hydraulic Fracturing: What Every Citizen Needs to Know! This event is co-sponsored by the Green Team and the Social Action Committee of the Unitarian Universalist Church. Refreshments will be served. What are your thoughts about UUCK worship? Who are we theologically? Take the survey today! Please join us on April 22nd for the Beth Sholtis art retrospective at 1:00 pm. Leadership development is very important at UUCK and our hope is to grow great leaders through on site training. In this workshop, we will explore various themes related to leadership, including what it takes to be in leadership and how to better your skills if you already are in a leadership role. The workshop will be held in the Annex on April 21st from 9:00 am to 12:00 pm. RSVP to [email protected] 4/18. The April Special Collection on Sunday, April 22nd is for Unitarian Universalist Service Committee’s (UUSC) Justice Sunday. The theme is “Justice Is the Human Right to Water.” Please see the Sunday Thread for more information. On Earthday, Sunday, April 22, The Green Sanctuary Committee is planning to brighten up the gravel-covered area behind the church. We must leave the gravel, as it protects the edge of the pavement behind the church. Children with their parents and others of all ages are invited to help put some plantings in this, our traditional gathering area. With the goal of bringing back flowers and greenery, we will plant sugar snap peas in the ground and pansies in pots. Later we will add other flowers and plants. The activity will take place right after the second service. Please come to help and bring your trowels and shovels. We also need adult volunteers to make some necessary preparations during coffee hour and the second service. For any questions or suggestions please contact Swanny or TedVoneida, Patty Miller, Angela Barzizza-Young, or Larry Cole. That on Saturday, April 28th, at 7 p.m., there will be a performance of “Give ‘Em Hell, Harry”, with Ted Voneida as Harry Truman. After intermission, there will be a few James Thurber skits, and as a grand finale, special guest Julia Childs will make an appearance to cook up a few ‘bon appetits’. Some of you purchased auction tickets; for others, there will be tickets at the door. Cheap – a heck of a deal. Come, have fun while supporting our church. All Annual Reports to be included in the Annual Meeting packet are due April 30th. Please submit or email reports to MaryBeth at [email protected]. Thank you. Annual Meeting packets will be available to the congregation on May 13th. Producer’s Description: What would you think if you found out that someone you knew had been around since the dawn of man? What questions would you ask and what mysteries could they unmask? Join seven skeptical scholars on a riveting journey as they uncover the history of man through one of their close friends, who reveals he was born 14 millennia prior.